Grew up… with her father, Isshin Matoi. Although a brilliant scientist, Isshin was less adept at parenting, preferring to focus on his research over his daughter. Profession… high school student. Although a high school, Honnoji Academy is run more like a military dictatorship, with everyone bowing to the all-powerful Student Council. Below Satsuki and her Elite Four, Honnoji operates on a hierarchy of "stars," with rank determined by how many stars a student's uniform carries. A no-star student currently, Ryuko must make her way through these ranks before finally facing Satsuki herself. Interests… pursuing her father's killer. Although a skilled fighter, Ryuko initially stands little chance against Satsuki's underlings, whose Goku uniforms infused with Life Fibers grant them supernatural strength. However, the tables turn when Ryuko finds Senkentsu, a sentient "Kamui" (a garment that’s alive) composed entirely of Life Fibers. Between battling Satsuki's minions and aiding the rebel faction Nudist Beach, Ryuko's schedule quickly fills up, though she still finds time to spend with her new best friend, Mako. Relationship Status… single. Despite the skintight nature of Kamui that flatters her figure, Ryuko has no interest in people unconnected with her father's death. Senkentsu and Mako are exceptions – but then again, the first is an article of clothing and the second has the personality of a hyperactive puppy. Challenge… avenging her father's murder. Ryuko still doesn't know who killed Isshin Matoi, but she's convinced that Satsuki has clues to the killer's identity. Between Life Fibers and the sinister plots of the Kiryuin Conglomerate (Satsuki’s family’s powerful company), it won't be an easy path to the person who killed her father. But with Senkentsu's help, Ryuko is determined to find and kill the murderer. Personality… determined, fierce, and extremely hot-blooded. A former delinquent, Ryuko is still clearly a rebel at heart, as evident in all her interactions with the Student Council. Independent and strong-willed, she prefers to work alone. But if her friends are in danger, Ryuko won't hesitate to jump into the fray. Ryuko Matoi's popularity ranking on CharacTour is #362 out of 5,000+ characters. See our top-ranked characters and read their profiles. 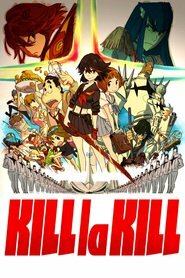 The story centers around two fiercely fighting schoolgirls, Ryuuko Matoi and Satsuki Kiryuuin. On a campus ruled by force, a transfer student wielding a Basami sword brings about upheaval.